The term “over” means “more than needed.” An over-engineered product is a product with more than needed capabilities and excess performances. 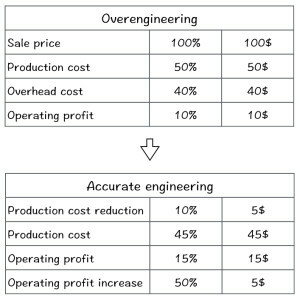 Excessive performances burden the product in terms of cost, size, weight, complexity, and more. The damage of over-engineering can be fatal; it can turn a potentially successful product into a loss. The impact of the product’s cost on the business is enormous. 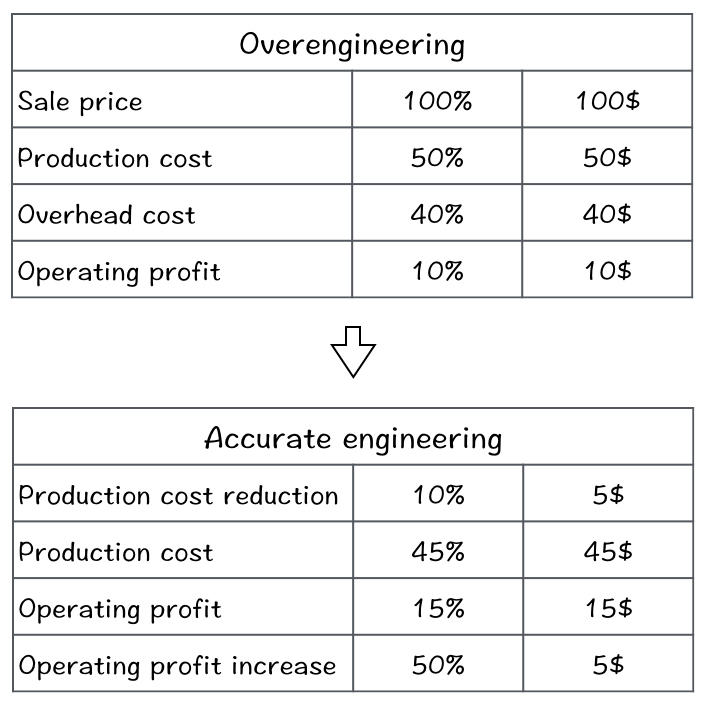 Reducing 10% of the product’s production cost is equal to increasing sales by 50% in terms of profit (for an average company with 50% gross profit and 10% operating profit). Let’s take a deeper look at each one of these three factors. Good engineering is an accurate engineering – one that reached the sweet-point between under-engineering and over-engineering. Accurate engineering is always based on and measured according to a product’s brief, which defines the product’s expected capabilities and performance. 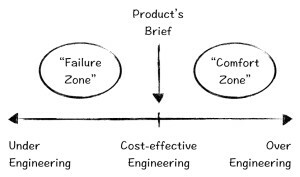 It’s impossible to achieve good (and accurate) product engineering without a clear and detailed product’s brief. Product’s testing is an important part of any R&D process. It defines whether a product has reached the expected performances and quality. In most cases, however, it doesn’t test “how” – in which design and in what cost the product has reached its quality. In other words, a common product’s test examines under-engineering failures but ignores over-engineering failures. It is very easy to recognize an engineering failure. Any kid can point out a broken or non-functioning product. Engineering failures explode in loud noise and cause great damage and embarrassment. On the other hand, it is very difficult to recognize an over-engineered failure. When the product works well nobody asks questions or looks for below the surface problems. This one-sided evaluation is the reason why engineers tend (consciously or unconsciously) to stick to the safe zone – to the over-engineering approach. Make sure your product’s Hard-Attributes brief is clear and accurate and includes all engineering specification, as well as the product’s testing methods. Adopt an over-engineering testing method – define the product’s potentially main over-engineering attributes (cost, weight, size, etc. ), and then challenge the product’s engineer to reduce 10-20% of each of these attributes while keeping track of the product’s brief. Be suspicious if the product passes the performance tests too easily. Create a symmetrical evaluation method for engineering – consider under- and over-engineering equally and call them both “failure”. Over-engineering can be found also in the product’s ancillary. Make sure to improve the product’s design in term of storage, shipment, assembly, maintenance, spare-parts and so forth. Reword engineers for accurate engineering design (not for robust over-design). Adopt “less is more” attitude. 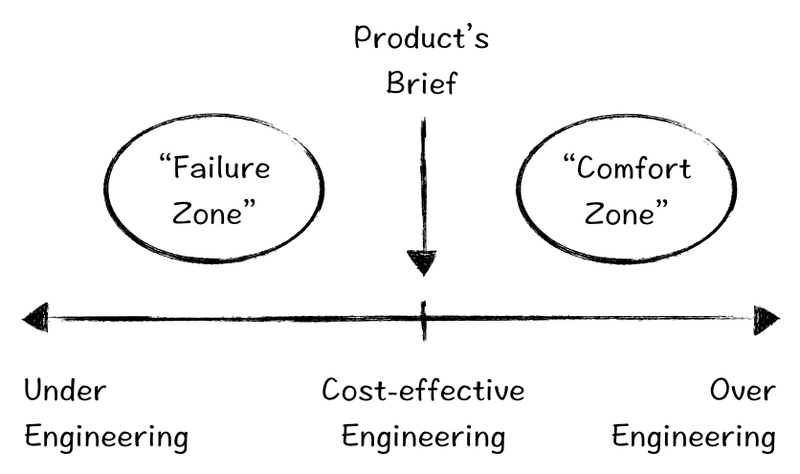 There is always tradeoff and tension between a product’s quality and its cost. Engineers know how to design good and cost-effective products – they know how to find the right balance between the two contradictory requirements. Yet, in an unbalanced environment, where under-engineering might turn out to be a great failure and over-engineering is ignored (or worth, considered as good and robust design), it is very hard not to add extra engineering safety margins. It is the product design manager’s responsibility to create a symmetrical engineering evaluation environment to avoid both, under-engineering and over-engineering failures. Aerospace – the tradeoff between performance and weight are crucial and requires very accurate engineering. Huge quantities and relatively simple product industries (IKEA, food industry) – any extra cent in product’s cost equals millions of dollars in turnover, and it’s quite simple and inexpensive to test the product’s performance. A few months ago I made a small survey about product design efficiency – I asked 64 active product designers and engineers about their working and product’s efficiency. One of the questions was about the product’s cost efficiency. Based on this survey, the average product’s cost can be reduced by 28%(!) with better and more accurate design. This entry was posted in Product Design Management and tagged Engineering, Product Design, Product Design Management, R&D by Yariv Sade. Bookmark the permalink. Someone should probably make an article or blog on how management or marketing teams are engineering failures. Forcing a poor product with hyped up advertisements are poison to both engineers & consumers. I hate how marketing teams try to dictate engineering design to make more profit while a much better product could have been manufactured at the same price. It’s as good as scamming consumers. Over engineering is very rare & often good engineering is criticized as over engineering just to get people to buy products again & again. But as of now we are stuck with this system.